In House Lab - GREENVILLE ANIMAL CLINIC & HOSPITAL,LTD. Bloodwork is a means of checking your pet's internal functions in a non-invasive manner. These tests can often reveal developing problems before your pet has started to show symptoms. We recommend routine bloodwork to establish baselines and for early detection of disease in older patients as well as periodically during many maintenance drug courses. 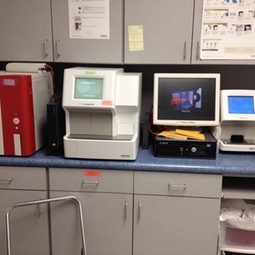 We offer a wide variety of blood tests, many of which can be run in our in-house lab for same day results. Outside lab work is typically processed through Idexx Laboratories, and results are often received within days.